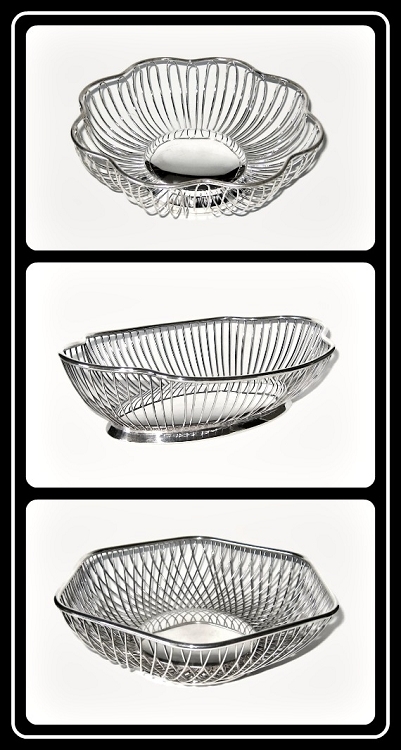 silver-plated vintage baskets. In my opinion, they epitomize the golden rule of William Morris, "Have nothing in your house that you do not know to be useful, or believe to be beautiful." silver basket which never falls far out of favor or style. The design and size of these pieces make them ideal house warming gifts as they attractively display everything from bread and fruit to napkins, washcloths and soap. The baskets were produced by American firms including Paul Revere Silversmiths, Gorham Manufacturing Company and W. S. Blackinton and exported to the U.S. by companies headquartered in Italy, Germany and China. A quick google search will show just how many 20th century art metal manufacturers offered a take or two on this perennially popular design. I recently visited the galleries of my Alma Mater, the Winterthur Museum and Gardens, coming face-to-face with the basket once again. Although similar to the vintage pieces at Q ANTIQUES AND DESIGN, this sterling silver antecedent was executed by Samuel Williamson of Philadelphia, Pennsylvania between the years of 1794 and 1813, making the design over 200 years old! I suspect the design may be older. Does anyone know of an earlier example? If so, please share the who, what, when and where in the comments below; I promise we will all marvel and delight at your mastery of the decorative arts! Good design is tasteful, timeless and at [the happiest] times, affordable. It is absolutely possible to fill your homes with lovely things without breaking the bank because—as in this case—imitation is the most sincere form of flattery.